The juvenile Open-beak Stork prepares to land. Jolies photos, ils ressemblent un peu à des cigognes. Ray: Oui ... Ce sont des cigognes asiatiques à bec ouvert, Martine. Yes...They are Asian Open-beak Storks, Martine. Ray: These blokes prefer snails to fish, Chris. Ray: I was pleased to grab the shot as it cruised towards me, Ruthiebear. Ray: Pleasant to observe these birds, Mary. Oh wonderful! I'm just spent a week in the company of someone who is an expert in bird photography, almost many other things. Ray: I am in awe of folks who know how to shoot birds well, Alan. Ray: It did seem a bit tentative, Bill...this is a Stork rookery, so there are lots of juveniles about. Great shots, Ray - your are lucky to have such birds around. 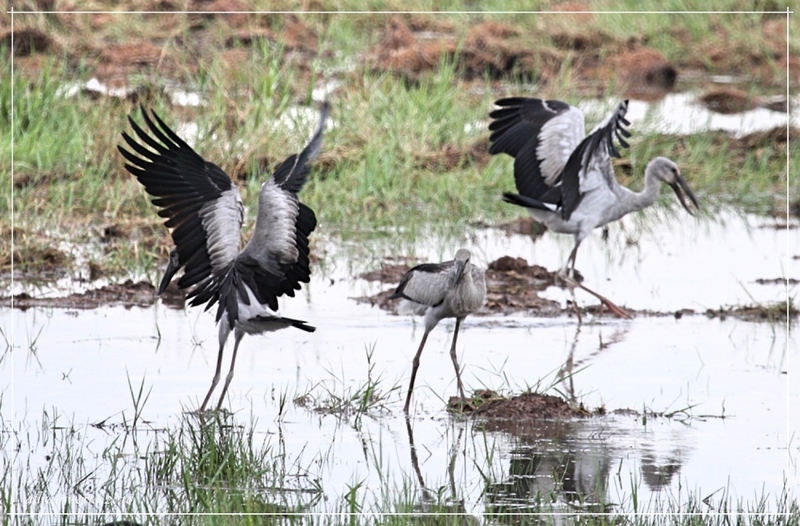 Ray: The Open-beak Storks are very common around out Village, Tom, and are useful to us rice farmers as they feed on the snails that feed on our young rice plants.